On Friday March 13, motorists were both frightened and alarmed as a women who appeared to be drunk weaved and swerved through the Holland Tunnel during rush hour, her tires striking the curb in the underwater tunnel that leads to Jersey City. According to an article at the New York Daily News, several drivers became so alarmed they dialed 911. 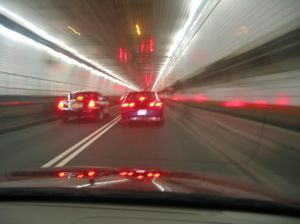 Upon exiting the tunnel, police pulled the driver over. It turned out to be 53-year-old Diane Reiners, a Brooklyn Episcopalian minister. Upon pulling her over, police found not only an open bottle of Absolut Vodka, but prescription medications for pain and anxiety, along with a second bottle of alcohol. The open bottle of vodka was found sitting in the center console of her vehicle, according to reports. Police administered a field sobriety test after pulling Reiners over, which she reportedly failed. As of Friday evening, her arraignment hearing was pending. According to another recent article at the NY Post, Reiners had begun a downward spiral prior to the drunk driving incident after losing her husband to tongue cancer several years ago. She was ordained as an assistant priest at Cathedral of St. John the Divine in 2012. Among the drugs found in her possession on Friday were more than 200 tramadol pills, according to the report. She is facing charges of reckless driving, drunken driving, and criminal possession. Michigan DUI attorneys know there are many reasons why people consume alcohol. Sometimes an individual will enjoy a drink or two at a friend’s house, or stop at a local bar after work to have a couple of beers. Other times, the issues is more serious – which appears to be the case in this incident. Tragedy in people’s lives can result in “self medication” to dull the pain, loss, and loneliness. Regardless of the reason, driving while under the influence of alcohol or drugs is never a good idea. Anyone who is arrested or charged with driving under the influence should remain silent, and contact a seasoned Michigan DUI defense lawyer immediately. It is vital to seek legal counsel in an effort to avoid a conviction and the resulting criminal penalties, which may include jail time, fines, driver’s license suspension, and more.